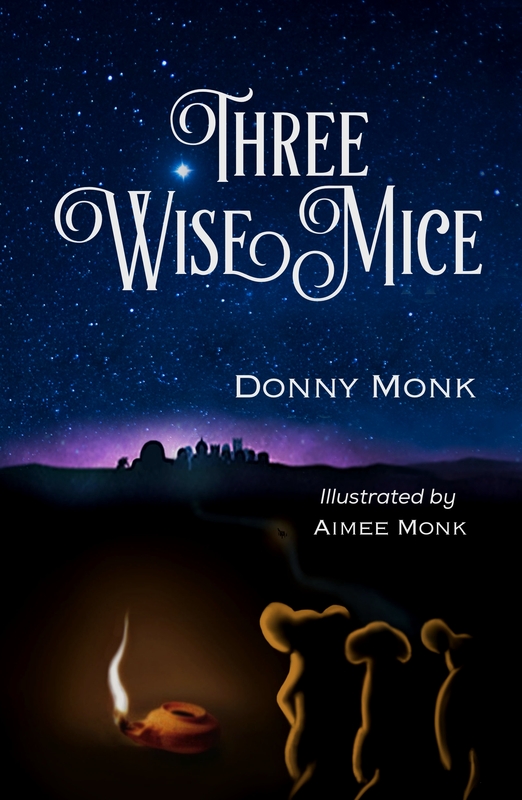 I’m very excited to announce the release of my next children’s book entitled “Three Wise Mice.” It is available now on Amazon and other outlets. You may follow this link to order your copies. 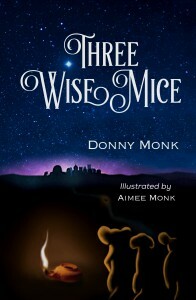 My daughter, Aimee, helped to bring the story to life with her cover art and her pen and ink illustrations in the book. For as long as I can remember, I have loved Christmas and Christmas stories. To this day, I’m still that wide-eyed kid taking in all the lights, colors, aromas and sounds of the season. It doesn’t take much to pluck my heart strings and put a lump in my throat. I’ve found that my imagination has an uncanny way of casting a different light on profound truths and actual events. It gives me a pathway to place myself in times and situations I wasn’t privileged to experience. I can enter a world of talking animals and impossible scenarios and for a moment be swept away to another world. It provides me a unique framework to strengthen my grasp of the truth as I view it from the innocent eyes of a child. So, take an imaginary journey with me back 2000 years or so. Allow yourself to identify with the smaller creatures who lived among the humans during this time of exceptional wonder. Hear the voice of the angel and the massive choir that joined him in the pronouncement of the Messiah’s birth. Sense the irresistible draw of the Baby in the manger and join me and the others as we make our way down the road to Bethlehem. It is my desire that this will be a story that your young children, grandchildren, nieces or nephews will enjoy reading or to have read to them this Christmas season. It was a cool, brisk night outside the little village of Bethlehem—the City of David as it was called. The air was clear and you could see the glow of the shepherd’s campfires on distant hills, surrounding the sleepy town. With all the visitors coming in for the census, it had been a busy day for the townspeople. Things were finally quieting down and lights were going out, one by one. On the hillside, the field mice were scurrying to and fro, darting from one hole to another. They were always busy, but who knows about what. The shepherds were telling stories about the days long ago when God had appeared to Moses and the prophets. And what great stories they were! Suddenly the night sky burst open with Light! The Light was so bright it seemed as if the whole hillside was glowing along with the rocks, the trees and the sheep. The shepherds, who belonged to these sheep, were all face down on the ground with their hands clasped around their heads, as if that could protect them from the blinding Light. No one moved! From somewhere in the Light, a thunderous, yet soothing, voice said, “Don’t be afraid.” Still no one dared to look! “I bring you great news that will bring joy to many people! The Savior, the Messiah, has been born tonight in Bethlehem!” A few of the shepherds slowly lifted their heads, squinting in the dazzling brilliance of it all. The rest of the shepherds were looking by now, then . . .
“Y-y-yes! So it wasn’t a dream!” another answered cautiously. “What should we do,” whispered yet another? “GO TO BETHLEHEM!” shouted the first. The other shepherds immediately fell back to the ground, afraid such an outburst might crack the sky open again. When nothing happened, they all agreed that they should make their way to Bethlehem. They snuffed out their fire, threw some provisions on their wool wagon and off they went. Zechariah and Matthew, a couple of field mice, had seen and heard it all. “Oh, every other night, or so. NO-O-O! Where do you think this is, Moses’ Mountain? Nathan, a third little mouse, was standing beside them. He had not moved a muscle or even blinked since the Light flooded the hillside. “Hey, look!” Matt stated matter-of-factly as he pointed down the hill. The shepherds were already quite far down the path that led to the village. Their voices and the light from their lanterns grew fainter as they scrambled along the way. “The wool wagon!” Nat exclaimed in horror. Now you may wonder why a mouse would be so upset over a wagon. You see, just for the fun of it, the mice would often catch a ride into town in this wagon. The shepherds used it to carry their wool to market. But now, the mice had missed their ride! The hillside was quiet now—and dark. A million stars winked back at them as they gazed up into the vast sky. It was only a few miles into Bethlehem, but for the mice, with their little legs, it just as well have been a hundred. “You really think we should go?” questioned Matt. “What!” Zack snapped and glared at him. Matt never did anything Zack said was dumb, and Zack wasn’t used to Matt thinking for himself. Zack’s mouth was still open, and, for once, he was at a loss for words. He just gave a disgusted grunt and walked away. “Hey, Zack! Come on!” Nat pleaded. Zack just kept walking and didn’t even look back. Well, there you go. Hope it makes you want to hear the rest of the story. please, head over to the store to get your copies in time for Christmas.